From October 10–14, in parallel with the Frankfurt Book Fair, TheArts+ trade fair will focus on cultural assets and intellectual property in the digital age through networking between industry and the cultural scene. CultLab3D presents its newly developed 3D scanning technology CultArm3D-P at TheArts+. 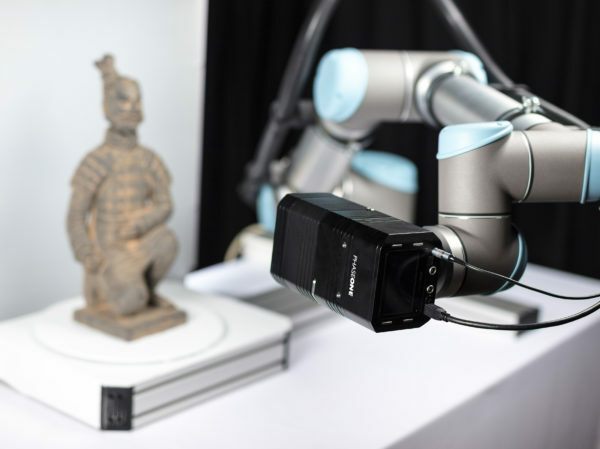 The robotic arm automatically scans the geometry and texture of previously unknown objects up to 50 cm in size. This is done on the basis of photogrammetry, that is, using methods that determine the dimensions and distance of an object based on image recordings. The 3D results are high-resolution and generally do not require any post-processing. Intelligent algorithms use a first scan to determine which others are needed subsequently. This allows the scan arm to independently plan the views required and capture any object with the optimum number of scans without the scanner having the CAD models. The result is a significantly reduced scan time of a maximum of 15 minutes. This unique feature makes CultArm3D-P the optimal and flexible solution to digitize any object in 3D. During the project »Digital World Views Online: 3D Models of Historical Globes,« the robotic arm scanner will be applied for the 3D acquisition of historical earth and celestial globes from the archives of the Friedrich Schiller University Jena and the Anna Amalia Library. The colorfast and detailed digitization allow the 800-years-old globes to be virtually accessible to enthusiasts. Visitors to the trade fair can see the benefits of the new scanning technology and learn more about the technological background and potential fields of application from on-site experts by visiting Fraunhofer IGD in Hall 4.1 at Booth Q90. On Wednesday, October 10, 2018, the head of Fraunhofer IGD, Prof. Dieter Fellner, will participate in a panel discussion on »How new technologies change the role of culture« in a micro-conference.